How Do I Buy Series EE Savings Bonds? Having already learned the great benefits of investing in Series EE savings bonds, you may wonder how you actually go about buying a Series EE savings bond for your family's investment portfolio. 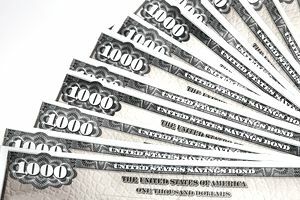 For many years, there were four easy ways to buy Series EE savings bonds, none of which were particularly difficult or complex. The bonds were issued in both electronic and paper format, each with its own purchase limits. The paper format made it possible to give savings bonds as a gift and have the recipient enjoy something tangible he or she could hold and take out of the safe deposit box every once in a while, encouraging accumulation and providing a sense of real ownership as he or she gazed upon the beautifully engraved documents. Unfortunately, following the Treasury Department's decision to prioritize electronic transactions, several of the ways to purchase Series EE savings bonds were discontinued and, effective January 1, 2012, no new paper bonds were issued to investors. It's all digital characters on a computer screen now. Since the changeover to digital transactions, almost all new Series EE savings bond purchases need to be made through TreasuryDirect, the Treasury Department's official securities portal. The bonds are issued directly to your account in electronic format, where you will see them cataloged alongside your other Treasury holdings such as Series I savings bonds, Treasury bills, bonds, and notes. You can access your bond portfolio 24/7 on the Internet and invest virtually any amount you want, to the penny (rather than buying in round denominations like the past), up to the applicable limits in place for the EE bonds in any given calendar year. For those of you who want to follow a disciplined dollar cost averaging program, you can even create instructions to automatically purchase Series EE savings bonds in amounts as small as $25. This is a very different process than the method used in earlier generations. Up until the transition to digital format, if you wanted to buy a Series EE savings bond, you would walk into a local bank or financial institution and order a paper certificate. As you learned in the beginner's guide to investing in Series EE savings bonds, paper bonds were issued at 50% of face value. In most cases, the paper certificate was sent to the recipient (or yourself, if you were buying for your own holdings) within 15 business days. According to the U.S. Treasury, the bond reflected the date you purchased it so you didn't lose any interest income during the processing period. There were many children who went through childhood collecting these pieces of paper, later growing up and cashing their Series EE bonds to pay for college, taking advantage of the special tax benefits. In the future, one imagines a slightly less romantic, if not less cumbersome, scene where they press a button and have their holdings transferred to the bursar. Times, they are a changing, as the saying goes. To encourage higher savings rates, some employers have worked with the Treasury to create payroll savings plans. The employee can sign up to automatically buy Series EE savings bonds through regular payroll deductions. By not seeing the money, he or she is effectively following the pay yourself first strategy. If this is something that interests you, check with your payroll or HR department to see if your employer offers this type of plan. For more information on buying Series EE savings bonds, visit our Series EE Savings Bond Guide. You'll discover tons of relevant articles, content, and resources to teach you about the rules, quirks, advantages, and disadvantages of these well-respected fixed income securities.